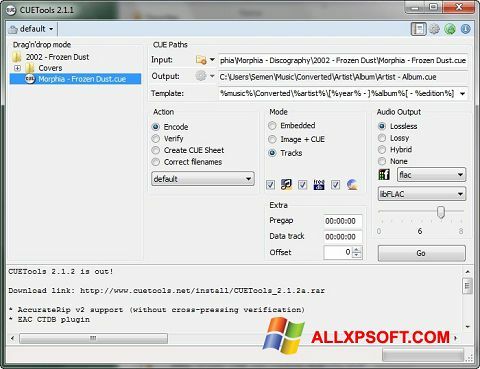 CUETools for Windows XP - a utility for accurate decoding of lossless files. The application interacts with images of albums, allows you to convert them with splitting into tracks, extracting CUE data, Log and Cover, includes the ability to perform the reverse operation, supports simple conversion methods. The utility has a CUE editor, can load tags from MusicBraiz, uses the AccurateRip database, can generate reports and files with a list of md5 sums. The program allows you to correct names, apply custom templates, correct pregap, offset and data information, perceives archived data and ISO images. You can free download CUETools official latest version for Windows XP in English.